I'm rapidly approaching my 600th restoration on the blog. I have just a handful more to go, in fact. You would think I would have surely covered all of the more common watches by now, which I probably have. However, it's interesting that I'm just getting to my next project - because it's a fairly ubiquitous model. The 1954 Wilson was produced through 1960 and even longer when you consider it was also used by the Awards Division. 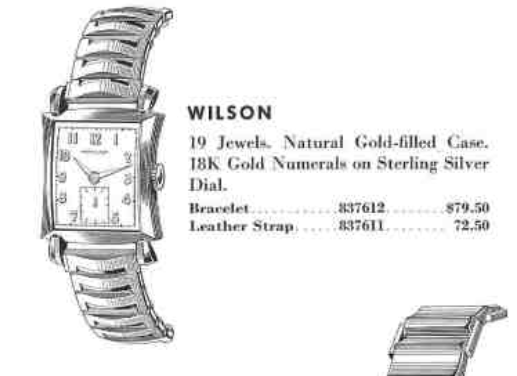 Originally the Wilson was outfitted with a 12/0 sized 753 movement, as indicated by the 19 jewel remark in the catalog depiction. There were only two 19 jewel movements in Hamilton's lineup at that time and the 754 was used in solid gold models. In mid-1955 the Wilson received the newly introduced 22 jewel 770 movement and it stayed that way for the duration. 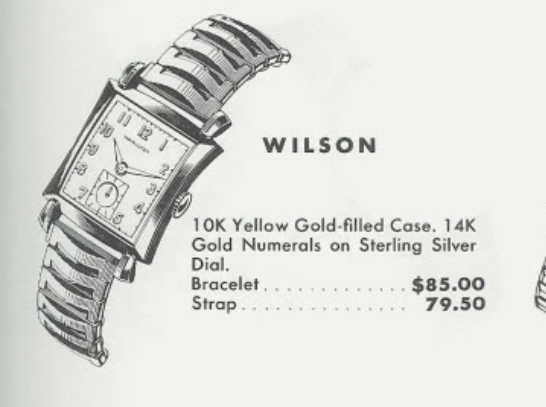 By 1960 the only thing that changed on the Wilson was the price tag... it went up a few bucks. I have tried many times in the past to land a Wilson but it seemed someone has always out bid me at the end. However, I finally got one recently and it could be because it was a bit beat up looking. Although the crystal is scratched up considerably, the case looks to be in better shape. The dial looks good too, although it's hard to tell sometimes when the crystal is a wreck. The back of the 10K gold filled case is in nice shape too. There's a hint of wear to the corners of the case back but nothing too distracting. The dial has a dull haze to it that indicates to me it's likely never been refinished. It doesn't really need to be cleaned either, maybe just a little to get the 14K numerals to shine better. The 770 movement looks very good - that's a bit of a surprise because I didn't see any watchmaker marks inside the case back. This watch has obviously been used a lot, based on the outside condition but the inside looks great. Everything is completely disassembled in order to be cleaned and once it's all dry I can put it back together with fresh lubricants. Before I can put the balance back on I need to installed the balance jewels in the main plate. There are two of them for each end of the balance staff. One supports the sides of the staff then there's a cap jewel to cover the end. The cap jewels are like tiny plates and there is a rim on one side. You can see both of these cap jewels have the rims facing up... that side goes against the other jewel when they are installed. The newly reassembled movement is now ticking away with good motion. It's off to the timer to see how well it's running. Good news and bad news, I guess. Good news is it's running cleanly with good amplitude. The bad news is the beat error is a bit high. 3.0ms is my usual upper spec limit and the closer to zero the better. 4.9ms is too high to let slide. Adjusting the beat error on this style of balance is a delicate operation. You need to rotate the brass collet that holds the hairspring to the balance staff so that you can effectively reposition the hairspring stud relative to the balance wheel. You have to do this without the balance installed in the watch so there's a bit of trial and error involved. Based on the position of the roller jewel on the other side of the balance, my guess is I need to move the hairspring stud a little counter clockwise so the silver-colored stud is closer to the balance wheel arm. Nailed it on the first try. I'll let it run for a little while before I try to slow it down. My merciless light tent reveals every flaw on a watch and this Wilson doesn't have too many. The dial appears more splotchy in my photo than it is in real life. It's actually a very pleasing, authentic-looking dial. Paired with a fresh glass crystal and a new genuine lizard strap, this Wilson is ready for 60 more years of wrist time. Dan thank you again for your posts. Your thoughts were well founded about the movement being loose in my Sea Mate II. I found a new crystal and it is good now. Except for the fact I left a little of the tape on the inside. This is the first crystal I have replaced. Can I take it out and clean off the tape and reinsert the crystal again? I put in a 29.4 and also purchased the 25.5 but could not seen to get it in. I'm not sure why there would be tape inside the crystal but yes, you should be able to remove and reinstall the crystal with ease if you use a crystal lifter (aka "the claw"). I also don't know why 29.5 mm would have been much harder than 29.4 but there is a point at which a crystal won't fit and perhaps it's there. Probably my inexperience with the claw as it is a new toy for me! I got the PHD 295 then went with a 29.4 as you did when you got the Henry McKenna Sea Mate II. Per your suggestion the new crystal has the movement tight and not rattling. It does not stop from the watch tilting or becoming inverted. My first Hamilton baby repair! This will be my new off work watch as it is running well and looking spiffy with a new brown lizzard band. I also picked up a Neilsen and what I think is a Norde. Both running. The Norde CDL turns and sets hard and seems to wind for ever without stopping. But is keeping time. In the need to use my new claw I thought I may try and open the Norde. But I think it has a glass crystal, not so good for the claw. But I stopped and thought I will leave well enough alone. Are you looking for a Norde for a project. It is pretty clean and running. I did put a couple of marks in the bezel before I decided to stop with the claw. Your information saved me from sending the Sea Mate II out for service and that means something to me. That would leave me with the Neilsen, Sea Mate II and my Frankenstein. Which is plenty as I wear my LL Bean Hamilton quartz to the warehouse I work at as a beater. A Norde is solid 14K gold, the Nordon is 10K gold filled - they are otherwise identical. I cringed when you said you tried to use the claw on it, as the claw is only for plastic crystal. The Norde / Nordon has a metal bezel that you pop off with a case knife. You can usually push the crystal out of the bezel from behind. It's typically a thick glass but I have often replaced it with a GS PA 318 - it's the same size and usually fits perfectly. The Wilson is a terrific model- nice size, interesting case design, 18mm strap...love mine - one of my most often worn watches. Great post Dan! I agree, it's definitely a unique watch and you're sure to be the only person in the room that's wearing anything even similar to it. As the proud owner of this exact watch I agree with both Dan's comments! Another great restoration Dan! Truly appreciate your work and enjoy your blog! I love Wilson’s. I have two, one given to my grandfather for 40 years with Cities Service in 1960 and another I bought that is likely a 1961 presentation model with a black face. On the latter, can you tell me how the second hand is attached? Is there a threaded shaft or is it “pushed” on. Mine keeps coming off and I can’t see how it is to be secured. Thanks in advance and thanks for showing your work on this great American watch.